Symthic Forum was shut down on January 11th, 2019. You're viewing an archive of this page from 2019-01-09 at 01:35. Thank you all for your support! Please get in touch via the Curse help desk if you need any support using this archive. THIS POST IS PREVIOUS TO FALL/2015 CHANGES: IT REMAINS VALID AS QUALITATIVE DESCRIPTION OF SHOTGUNS BEHAVIOUR. VALUES BELOW 24 METERS ARE VALID QUANTITATIVELY. In a previous post I have given some results of damage depending on the number of pellets cartridge based on a probabilistic approach which assumed uniform distribution in the circle of dispersion (if the head occupies 10% of the circle will receive 10% of the pellets). Actually pellets are randomized to the radius and angle which gives a distribution with a bias to the center. I have applied the MonteCarlo method which is a computational algorithm suitable for this type of phenomena, generating 136,080 pellets fired for each distance, and evaluating therefore 2.73 million pellets for each shotgun configuration (ads, choke, aiming...). The MonteCarlo method basically consists of generating a large number of random events (with the rules of the physical process) to obtain a synthetic sample that can be analyzed statistically. I used a simplified and targeted hitbox. Pellets are "clusterized" in groups of 12, 15,18 and 21. The spread Xs, Ys of center of the circle of dispersion are calculated in the same way (polar random too) depending on the form of targeted (ADS, HIP...) that applies equally to each group previously calculated. 130,080 pellets are generated for each distance. The origin X=0 and Y=0 is centered in chest. Arms or defensive spec are not considered. An algorithm for hit (in or out) is calculated for each pellet. Damage for each group is obtained and the statistical parameters: mean, median, mode, standard deviation, quartiles, values> 100 and> 50, etc ... are obtained for every 5 meters between 0 and 50 m and 10 m between 50 and 100 m.
Given the method used, the geometric irregularity of the hitbox and that the value of the damage is discreet (There is not half pellets) obtained curves are not smooth and have a tendency to step. To not write a long post I will display results with little comment, although each graph provide enough material for a long discussion. 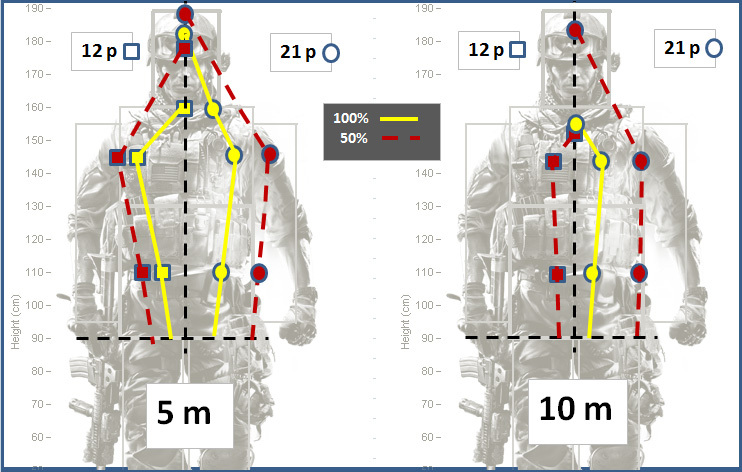 Distances for mean value 100, 11 m for 12 p., 14 m for 15 p., 17 m for 18 p. and 22m for 21 p..
A shot with 21 pellets kill at 10 m with pprobability 100%, and has a wery small probabiliy to kill at 35 m.
Standard deviation varies nonlinearly with maximum dispersion of damage at 20 m (approx). 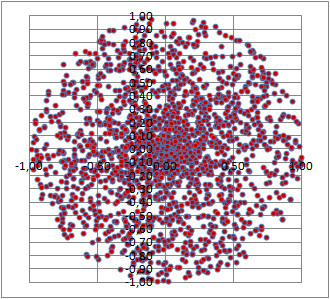 Frequency of damage at a specified distance (25 and 50 m calculated) (this is the lateral dispersion around mean value). It can be assumed normal distributions of damage despite a small asymmetry (right tail). 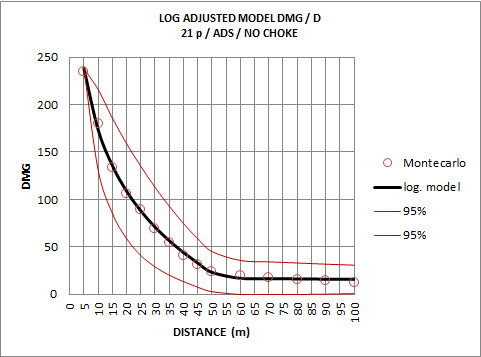 Full choke improves the mean damage 20% (approx.) and is not very useful at very short range. 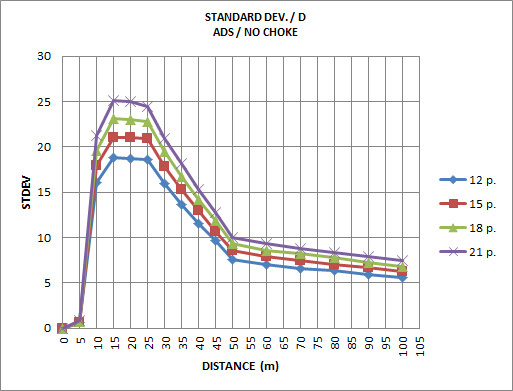 The effect is like moving curves damage to 5 m further (approx.). We can model curves of damage in three domains, constant maximum damage up to 5 m (exactly to 5.96 m) - not represented- and two logarithmic models, one from 5 to 50 and another from 50 meters. The confidence interval of 95% is represented. Note the variation of size due to variation of standard deviation. No deviation exits at 5 m: all pellets in target. 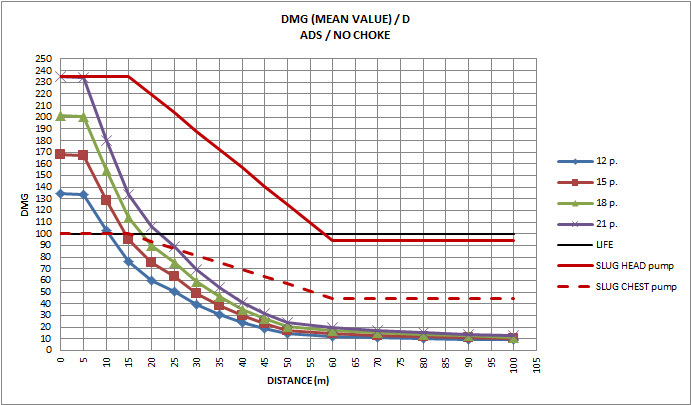 DMGu = Unitary pellet damage at distance D, obtained from the basic curve damage. 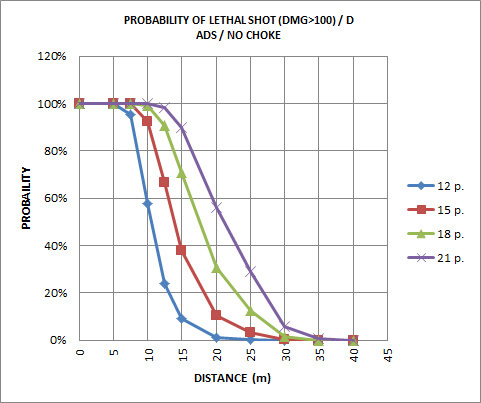 For 10 m, average value of 5 m to 15 m.
Here you can see the graphics ( 5 m and 10 m) that represent the area of aiming in which one death with 100% probability and 50% Probability is achieved. 12 -left- and 21 pellets -rigth-. Discussion about flechettes and defensive spec. below. Shotguns, statistics and probabilistic analysis. Me very, VERY gusta. So the shotguns were buffed quite a bit after all. OHK ranges are way longer now and almost cover 2/3 of the kills done in the game (implying you hit with them). Not going to say anything about balance tho as it would be so biased. Btw forgot to ask: Did you reduce the damage of one pellet when you increased the number of pellets? Either I am blind or it doesn't say anything about that in the post. Would be nice to see how, say, the last patch balanced shotguns. Variances between damages from different shots etcetc. I have applied the damage/pellet of the game: 11.2 up to 25 m, linear decrease and 5.6 from 50 m for any number of pellets. Is there any way (easy) to recover pre-patch stats?. Did you account for pre-patch spread values? The dispersion and spread pre-patch is the problem. You can see a variable angle for circle that now doesnÂ´t change. The nominal value of spread ADS=0,1 shown in stats now...what was previosly?